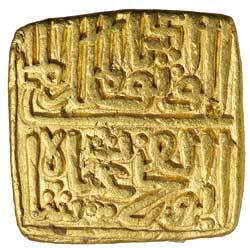 SULTANS OF MALWA, Ghiyath Shah, (A.H. 873-896, A.D. 1469-1500), square gold tanka (10.87 g), no Mint but probably Hadrat Shadiabad, dated A.H.883 (1477-1478 A.D.), (G&G M66). Very fine and scarce. 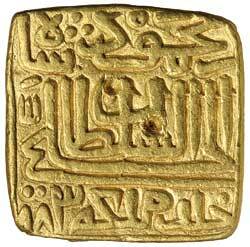 SULTANATE OF BIJAPUR, gold pagoda (c.1650) (GG BJ47). Nearly extremely fine, scarce.